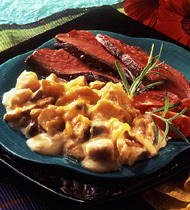 Create variety and excitement to your menu. 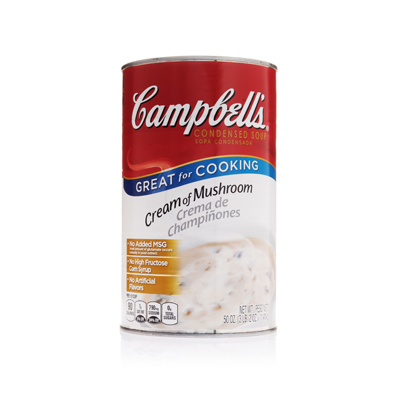 Amp up plain mashed potatoes with Campbells® Condensed Cream of Mushroom Soup, Swiss and Parmesan cheese! 1. Combine soup, milk and pepper. Mix until well blended. 2. Layer half the potatoes, Swiss cheese and Parmesan cheese in full hotel pan (20x12x2). Repeat layers. 3. Cover and bake at 400º F. for 45 minutes. Uncover and bake 15 minutes or until hot.CCP: Hold at 140°F. or higher. Portion using 1 cup each.